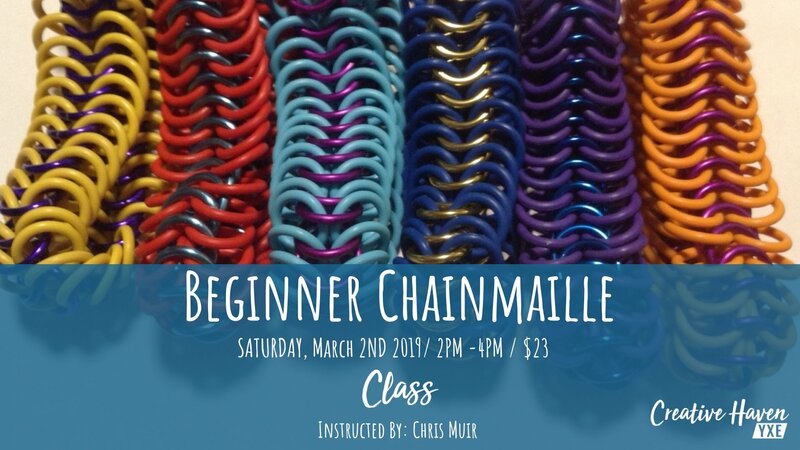 Creative Haven YXE has teamed up with Chris Muir to offer this amazing beginner Chainmaille workshop. This workshop is for beginners or anyone wanting to brush the cobwebs off their skills. We will be building simple bracelets out of a 6 to 1 pattern using coloured aluminum and neoprene rings. Please sign up early and let us know a couple of your favourite colours so we can plan ahead. Chris started making chainmalle with a friend in 1989 building competition armour. Once the armour project was done Chris just kept creating and trying different techniques to improve the comfort and flow of the garments. By the late 1990's he was selling costume and real armour to re-enactment groups and the movie industry alike. Not satisfied with bare metal alone he worked with The Ring Lord and began experimenting with different colouring processes and metals. Chris' largest publically viewable project is a lighting installation patterned by Chris and made in partnership with TheRingLord.com, it lives at a bar called The Home in Los Angles each of the three chandeliers consists of 187,000 hand wooven 9/16" acid etched aluminum rings, stand 6' high and is 8' in diameter. Most often though you can find Chris working on costume pieces, he incorporates curvature into an otherwise 2D pattern to make comfortable, stretchable clothing and jewelery.